Mom, the Intern: Arizona peeps: something fun to do this Friday night. Arizona peeps: something fun to do this Friday night. If you're looking at your calendar, thinking, "Man, I have NOTHING to do this Friday!" then I have a dandy-fine solution for you! I am so, so SO x infinity excited for this concert. And not just because I'm singing in it, though I'm pretty stoked about that, too. 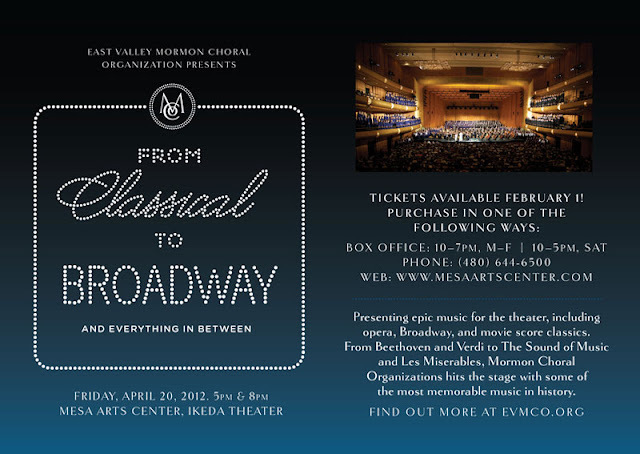 We are performing the memorable music of the masters -- Mozart, Verdi, Bizet, Beethoven -- as well as some of your all-time favorite Broadway show tunes. Also, a stunning arrangement of The Prince of Egypt's "When You Believe," performed by all the choirs and orchestra. Seven-hundred people to personally blow your socks off. Oh yeah! I almost forgot. Our illustrious conductor Brandon Stewart will be performing the finale of Rachmaninoff's Piano Concerto No. 2 with the orchestra. Which ... yeah. He's outstanding. I promise if you go, you will not be disappointed. In fact, I'll do you one better -- I promise if you go, you will do everything in your power to go to the next concert, and if you can't, you will weep into your pillow every night with regret. Yes, I realize this is a hefty promise. But I'm just that confident. And if you have any doubt, then prove me wrong by going! Come support this fabulously talented and local organization! We'd love to see you at the Mesa Arts Center this Friday evening! But hurry -- tickets are almost gone! Man, I want to go to this so bad! We tried to get tickets last week, though, and only the most expensive ones were still available, so it was unfortunately out of our price range. I'm pretty bummed about it. I'm sure it will be awesome!